Figure 10.13. Codon-anticodon pairing of poly(U) with cognate and noncognate tRNA species. UV, 5-carboxymethoxyuridine (cmo5U or V); U*, 5-carboxymethylaminomethyl-2'-O-methyluridine (cmnm5Um); Uu, U probably modified. GQ, queuosine (Q) (see Fig. 3.3). et al., 1990). That is why all living organisms in their evolution are forced to keep a balance between a reasonable level of accuracy of the translation machinery and an adequate rate of protein synthesis and cell growth. It follows from what has been said above that miscoding depends primarily on the affinity of anticodon to codon. Affinity is strongest when the anticodon is complementary to the codon, and therefore the cognate tRNA binds to the codon preferentially. Affinity is lower, but still exists, in the case of partial complementarity and, thus, some noncognate ("near-cognate") tRNA species may bind to the codon as well. Experiments on different polynucleotide complexes have demonstrated that the difference in affinity constants, in the case of complementary or partially complementary pairing, is largely determined by the differences in the lifetimes of the complexes, i.e. in the rates of dissociation, whereas the rates of formation do not differ greatly, if they differ at all. All this suggests that the probability of a wrong anticodon-codon complex being formed is just as high as the probability of a correct one, but the wrong complex decays faster, i.e. has a shorter lifetime. If reversible codon-dependent tRNA binding in the elongation cycle is followed by an irreversible stage, then the rate of the irreversible process will affect the level of miscoding: the higher the rate of the subsequent irreversible stage the greater the level of miscoding (Ninio, 1974). The role of such an irreversible stage may be played by transpeptidation with subsequent translocation. In fact, because the times of complex formation of the codon with the cognate tRNA and the noncognate tRNA are roughly the same the discrimination between the tRNAs is based only on that the wrong complex decays faster. However, if the rate of the next stage of the cycle is very fast and is comparable to the rate at which the wrong complex decays, the probability is high that the noncognate tRNA will be drawn into the cycle. Clearly, the higher the rate of the following stage, then the more the tRNA binding conditions differ from the equilibrium ones, and the greater the probability of the noncognate tRNAs being captured. Conversely, if the subsequent irreversible stage proceeds at a slower rate, the conditions will approach equilibrium and the discrimination between cognate and noncognate tRNA species will depend to a larger extent on the difference in their affinity constant toward the codon. As a means of reducing the miscoding level, the ribosome may possess a special mechanism of kinetic delay at the stage of reversible codon-dependent aminoacyl-tRNA binding. EF-Tu (EF1A) could play this role: this protein bound with GTP blocks the subsequent step of the cycle until GTP is hydrolyzed, while the ternary complex remains reversibly associated with the ribosome. On the other hand, discrimination between the cognate and noncognate tRNA on the ribosome may be even further amplified than follows from the simple difference in affinity constants. If in the process of aminoacyl-tRNA binding there are two successive reversible phases which are separated by a virtually irreversible step, the aminoacyl-tRNA will have two independent chances to dissociate. In this case the overall dissociation probability is equal to the product of the dissociation probabilities at the two stages, i.e. discrimination between the cognate and noncognate tRNA will be significantly amplified compared to the difference in affinity constants (Hopfield, 1974). This is a mechanism of kinetic correction, or "proofreading." Again, EF-Tu could perform the role: the first stage of reversible binding could include the binding of the ternary Aa-tRNA:EF-Tu:GTP complex prior to GTP hydrolysis; GTP hydrolysis would represent an irreversible separating step; and the aminoacyl-tRNA would then have another, independent chance of dissociating from the complex with the codon at the stage of EF-Tu:GDP dissociation from the ribosome (see Fig. 10.14). In the case of the cognate aminoacyl-tRNA, the rate of the side reaction 4' (decay of a codon-anticodon complex prior to EF-Tu:GDP release) will be low, compared to the main reaction 4 (release of EF-Tu:GDP), i.e. k4 >> k4' In the case of a less stable complex with the noncognate tRNA, the side-reaction 4' proceeds much faster and competes with the main reaction 4, i.e. k4'> k4 (Fig. 10.14). Thus, discrimination between the cognate and noncognate tRNA is accomplished twice: on the basis of differences in the rates at which the codon-anticodon complex decays in reaction 2 (difference in k-2) and on the basis of the difference in the rates at which the codon-anticodon complex decays in reaction 4' (difference in k4'). GTP hydrolysis, which is a virtually irreversible process, serves to separate these two stages and, in this sense, the released free energy dissipating into heat increases translation fidelity. In the course of elongation, different aminoacyl-tRNA species are present in the solution surrounding the ribosome. The aminoacyl-tRNA corresponding to the template codon positioned in the A site should be selected from this mixture by the ribosome. To achieve this end, a rapid scanning of different aminoacyl-tRNA (Aa-tRNA:EF-Tu:GTP complexes) should be performed and only the complex recognized by the ribosome as a codon cognate should remain bound to the ribosome. Such scanning assumes multiple collisions between the codon fixed on the ribosome and the anticodons of different tRNAs. It may be asked whether this is achieved by random diffusional collisions between nonoriented tRNAs and the ribosome or whether there is a rapid formation and decay (a run-through) of short-lived intermediate complexes between the tRNAs and the ribosome, where collisions between the anticodons and the codon occur in the proper orientation. Figure 10.14. Pathway of aminoacyl-tRNA entry into the elongating ribosome. RS* is an elongating ribosome carrying peptidyl-tRNA in the P site. The bracketed parts of complexes are presumed to be in loose and transient association with the rest of a complex. ribosomal complex results from a collision between the ternary (Aa-tRNA:EF-Tu:GTP) complex and the ribosome followed by a specific orientation of the tRNA. Seemingly, the codon-anticodon interaction is not used in the transient complex formation. It can be assumed that the rapid formation and decay of such short-lived complexes is used for the scanning (run-through) of anticodons. Only when the anticodon fits the codon does this result in recognition which induces the rearrangement of the complex and thus leads to the transition to the next binding phase. It is likely that EF-Tu moiety of the ternary complex may help in the formation of the intermediate short-lived ribosomal complex: it may transiently interact with the factor-binding site (L7/L12 stalk area) on the 50S ribosomal subunit thus properly orienting tRNA on the 30S subunit for the codon-anticodon collision. This stage of tRNA binding, prior to codon-anticodon recognition, may be designated as scanning state, or T state of the ribosomal complex. Studies on the multiphasic kinetics of tRNA binding have demonstrated that when the P site is occupied and only when the cognate codon is present in the A site, the above rapid phase is followed by a slower phase during which the intermediate short-lived complex rearranges into a more stable complex. As a result, the anticodon of tRNA becomes specifically bound with the codon in the ribosomal A site. Experiments with nonhydrolyzable or slowly hydrolyzable GTP analogs have demonstrated that, at this stage of codon-dependent binding, the aminoacyl-tRNA or, more accurately, the ternary aminoacyl-tRNA:EF-Tu:GTP complex, is reversibly associated with the ribosome and, therefore, if GTP hydrolysis is not very fast, equilibrium can be approached. Thus, this stage provides the first step of aminoacyl-tRNA selection according to its coding specificity (Fig. 10.14 (2)). If the interaction underlying the formation of the intermediate short-lived complex continues after codon-anticodon recognition, the aminoacyl-tRNA will then be bound to the 70S ribosome by at least three points: (1) by the anticodon through the mRNA codon with the 30S ribosomal subunit, (2) by the acceptor arm through EF-Tu with the 50S ribosomal subunit, and (3) by an unknown point of the nonspecific interaction with the A site on the 30S ribosomal subunit (possibly through the D arm). This is the so-called A/T state of the ribosomal complex. In this state, hydrolysis of the EF-Tu-bound GTP is induced (Fig. 10.14 (3)). Hydrolysis seems to be induced by the EF-Tu interacting with the factor-binding site of the 50S subunit. The hydrolysis of GTP, an apparently irreversible step (due to a great difference in the thermodynamic potentials of GTP and its hydrolysis products), divides the aminoacyl-tRNA binding process into two phases which are not connected by equilibrium. The shorter the time interval between tRNA recognition and GTP hydrolysis, the lower the selectivity of the recognition phase. If hydrolysis is artificially delayed, e.g. by using a slowly hydrolyzable GTP analog, such as guanosine 5'-(g-thio)-triphosphate (see Fig. 9.8), the discrimination between the cognate tRNA and near-cognate tRNA (e.g. tRNAPhe and tRNA) increases to a ratio of 104 in favor of the cognate species. GTP hydrolysis results in a drastic decrease in EF-Tu affinity to the aminoacyl-tRNA and the ribosome. This is the result of the conformational rearrangement of EF-Tu when it becomes bound to GDP instead of GTP. GTP hydrolysis leads to an intermediate ribosomal complex in which EF-Tu has no longer an affinity to the aminoacyl-tRNA. Consequently, the aminoacyl-tRNA has lost its attachment to the ribosome through EF-Tu. 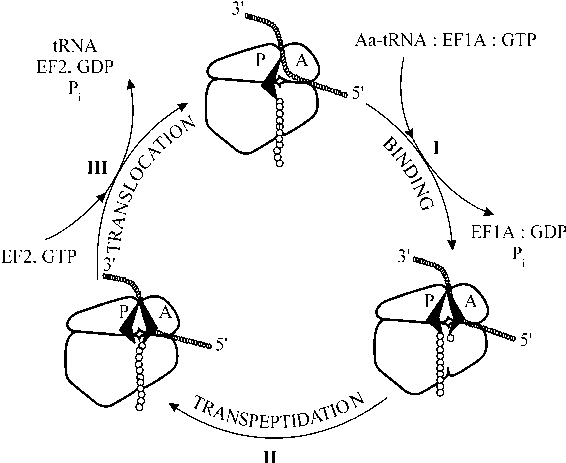 It now has another opportunity to dissociate, and if its dissociation rate is particularly high, as is the case for noncognate tRNA, it may be released prior to EF-Tu:GDP leaving the ribosome (Fig. 10.14 (4'), right path). However, if the rate of its dissociation is not that great, because of a correct codon-anticodon interaction, EF-Tu:GDP will be released earlier (Fig. 10.14 (4), left path) and the aminoacyl terminus will be captured at the 50S ribosomal subunit. Thus, after GTP is hydrolyzed, the ribosome is presented with a new opportunity to correcting the result of aminoacyl-tRNA selection made prior to GTP hydrolysis. After GTP hydrolysis and the subsequent release of EF-Tu:GDP, the acceptor end of aminoacyl-tRNA interacts with the a site of the peptidyl transferase center of the 50S subunit. Thus the aminoacyl-tRNA becomes fully locked in the A site. This is the final phase of aminoacyl-tRNA binding to the A site - the so-called A/a (or A/A) state of the ribosomal complex (Fig. 10.14 (5)). Now the aminoacyl-tRNA is ready to react with the P-site-bound peptidyl-tRNA, and transpeptidation follows. In the course of enzymatic binding to the mRNA-programmed ribosome, the aminoacyl-tRNA passes through a series of consecutive phases (Fig. 10.14). During transition from one phase to another, certain contacts between the aminoacyl-tRNA and the ribosome may change, but eventually the full binding to the A site (A/a state) where this substrate is ready to chemically react with the other one, peptidyl-tRNA in the P site, is attained. The general scheme of the sequence of events described above is given in Fig. 10.15. Figure 10.15. Sequence of events during aminoacyl-tRNA binding with the ribosome.